One of the most challenging things to do with a bunch of kids is clothes shopping. The kids want to touch everything, there aren’t carts to trap them in, and don’t even think about having to go into a fitting room! To make matters worse, these kids keep growing, leaving me little choice but to buy more clothes. Granted, I could spend some precious time without the kids to go shopping, but I tragically have ended up with two little girls with serious feelings about what they wear and the odds are I will bring home the entirely wrong things. 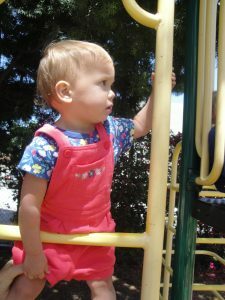 Kids fashion may not always be my top priority, but it seems to be theirs. Theoretically I wouldn’t mind taking Evie or Izzie on a solo “shopping spree” but this ends one of two ways. 1. Evie wants every single skirt/dress/blue thing in the store (sub in “yellow thing” for Izzie). Whatever she’s into at the moment must be hers and we will either leave with bags full and my wallet empty or without any clothes and me pulling a screaming threenager out of the store, never to be seen there again. 2. I manage expectations and Evie agrees to pick out one skirt/dress/blue thing (again, yellow for Izzie). She then spends the next seven and a half hours waffling between near identical items until I scream, lose my mind, and offer to buy both. Then she smells my weakness and resorts to #1. A big thank you to Wee Blessing for sponsoring this post by providing our first box! As always, the thoughts, experiences, and opinions expressed here are our own. This is an honest review of everything sweet – and anything salty – about Wee Blessing! Wee Blessing is a professional children’s styling service tailored to your taste, budget, and lifestyle that helps you feel your best and gives you back what matters most…your time! And, let’s face it, your sanity. You can sign up for monthly deliveries (or quarterly – or every six months – whatever works for you!) and have zero obligation to stick around. You can skip months or cancel at any time, which is a HUGE draw for me. Plus, you’re not pouring a ton of money in each month. You only pay the $8 shipping fee to receive your box. Then you can choose which of the 4 outfits you want to purchase (at a significant discount from the stores). Buy all 4 outfits and you get an extra 10% off. Whatever you don’t want, you send back in a prepaid package. It sounded really easy and sort of like a no brainer, so I was almost looking for the catch as I got started. You start by creating your style profile. It starts off basic enough: name, birthday, age, clothing sizes, etc. 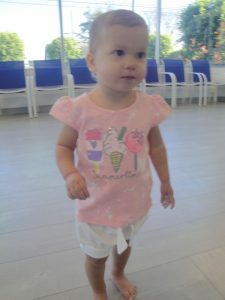 Since, let’s face it, baby girl clothes are categorically the cutest, I decided to create a profile for my 18 month old daughter Isabella. Now that we’re past her basic info, it gets real adorable, real fast. For basic style, you can choose between, “Trendy,” “Diva,” “Sporty,” “Casual,” and “Whimsical.” Izzie’s a real girls, girl, so we went with Trendy and Whimsical – because, let’s face it, she’s got lots of casual and sporty hand me downs from her sister! Next, you can choose what types of clothes your child likes – and what they don’t! Which is great, because Izzie HATES jeans and accessories! But she loves leggings, skirts, rompers, hoodies, dresses and bathing suits. And I got to detail all these preferences so that we got the types of items she needs and will wear. You can also add what your child is into, any hobbies they have, and their interests. The next page is my favorite to do with the kids. First question – favorite princess (superhero for the boys)! Sweet little Izzie didn’t have a lot of opinions on that one, but Evie sure did! Then you select their favorite colors. Izzie may not have preferences here either, but the big kids have decided her favorite colors are pink and yellow, and she does look adorable in those, so we went with that. Lastly in this area, you pick what kinds of prints you like, which is such a smart idea! And super fun for the kids to give their own input again. (We picked chevrons, florals, polka dots and solids). Finally, you have the option of adding information for shoes and telling them which stores you normally shop in, to help tailor your order. I loved how thorough and cute the Style Profile was, but I admit to wondering how much they would really take our preferences into account. I was sooooo excited for the day my Izzie’s box arrived. I opened the box and pulled out a carefully wrapped bundle of clothes in pink tissue paper. As I pulled apart the tissue paper I literally gasped. I was immediately impressed at how completely the clothes reflected the responses I’d given in the Style Profile. 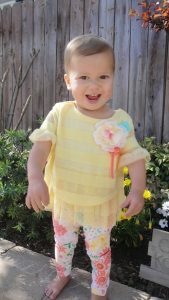 Yellows and pinks and florals and dresses and shortalls and everything was sooooo Izzie. I basically died for this one. The top was so soft and sweet and yellow and she looked like a little ray of sunshine and I decided I love her forever because of how cute she was. While white shorts may not be our go-to outfit for our messy mud-play days, this one is just too cute for summer – so yeah, it’s a keeper too! Rough Izzie play tested, Mama approved! Because who doesn’t love some chunky toddler legs sticking out of super comfy shortalls?? 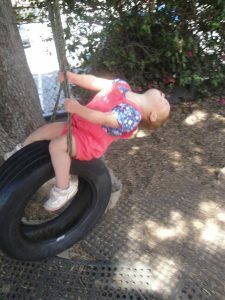 And because I can’t help myself….She came in like a wrecking ball. Now I can practically hear the skeptics out there saying, “But Christine, surely they weren’t all winners, right?” Wrong! Well, sort of wrong. 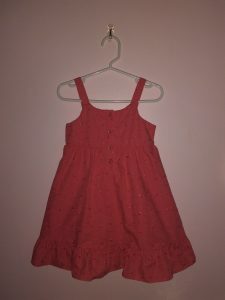 See, the last item in our box was this adorable coral colored eyelet dress. It is exactly the kind of dress that I would have picked out for this summer. I may have actually hugged it when I pulled it out of the box. And then I tried it on Izzie. And she HATED it. 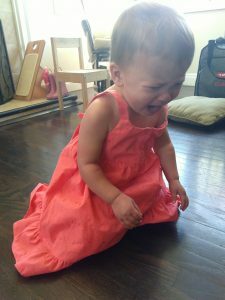 She hated it when I tried it on her after lunch, she hated it when I tried it on her after bath and she hated it when I tried to bribe her to love it by giving her a cookie. I tried for three days to get her to like it – at least enough for me to get one semi decent picture – and it was a total failure every time. I was disappointed, because it felt like a fail. But then I realized that’s EXACTLY why you want this box. Because I would have absolutely bought this in the store and then been devastated when she refused to wear it. I never would have returned it because I’m not going BACK to that store to return something and it would have taken up closet space forever. So, as sad as I was that she was never going to wear this dress in public, at least it was incredibly easy to put it in the pre-paid bag, shed a tear and drop it in the mail. I loved it. I don’t think I would get it for every kid, every month, but I think it would be something super lovely to do with the kids in their birthday month, or for special occasions. Additionally, it would be an ADORABLE gift for a niece, grandchild, family friend. You could let them pick their preferences, submit and then shop the box together selecting a special outfit (or two or three). And I definitely think if you are even a little bit interested you should try it! 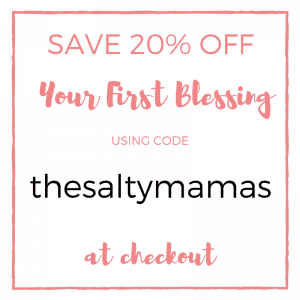 Because if you use our code The Salty Mamas during checkout, you’ll get an extra 20% off anything you purchase out of your first blessing (box). Ready? Click here to get started! We hope you’ll try it out and share with us what you got!! Oh my goodness, that yellow outfit! Heart eyes emoji!! We could not BELIEVE how well the outfits matched her personality! It was amazing. Your little girl is so cute! I love how thorough the profile process is — looks like it ensures some great matches. She does not look she liked the last dress at all. Haha! All of the clothes were suoer cite though! Awe sweet baby in that last picture! My almost 2 year old princess is the same way – she knows what she likes, and wants to wear what SHE wants to wear 🙂 Don’t get me started on shoes…..
Those outfits are absolutely ADORABLE!! Such cute outfits! She is a doll! Our daughter also loved her Wee Blessing package this month. She got all dresses in her favorite colors! First of all these outfits are adorable!!! Hopefully she’ll warm up to the last dress because it’s so cute!! WeBlessings sounds like it was sent from above! Inexpensive, cute clothing sent right to your door?! All the yeses! !